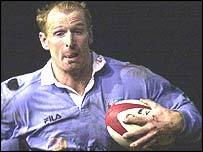 Former Wales and Lions captain Gareth Thomas has joined Cardiff Blues for next season, with lock Paul Tito. out of his deal last summer. "It's a done deal, we've signed Gareth and New Zealander Paul Tito," Blues chairman Peter Thomas told BBC Sport. "Gareth's prowess speaks for itself, while Taranaki captain Tito follows the path of Xavier Rush and Ben Blair." ideal cover for the likes of Robert Sidoli during the World Cup. "The New Zealanders in our squad have added a real edge," Thomas told BBC Radio Wales' Back Page programme. But the signing of Thomas, Wales' record try-scorer and second most-capped player, will capture the headlines. was blocked by his directors. Tito is a good signing for the Blues too. Harlequins have failed in an audacious bid to sign England World Cup star Jonny Wilkinson from Newcastle Falcons. The Daily Mail reports that the Falcons rejected a £250,000 offer for the injured fly-half, who is under contract at the Tyneside club until May next year. Since his staring role in England's victorious World Cup campaign in Australia in 2003, Wilkinson has been dogged by injury, including a serious shoulder complaint and a hernia. The 27-year-old has made just three appearances for the Newcastle this season owing to a lacerated kidney. Despite on-going concerns regarding his fitness, it is understood that Leicester have also renewed their interest in the player. Like Harlequins, the Tigers were warded off with a flat "no". 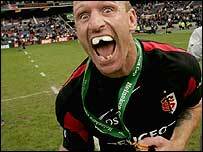 The aborted luring of Wilkinson to London by Harlequins manager Dean Richards is the former England man's second attempt to sign the player. When at the helm of Leicester, Richards made enquiries about Wilkinson before the World Cup. But he failed to uproot the player who joined Newcastle as a 17-year-old. The Falcons' insistence in keeping hold of their captain shows the faith they have that he will soon return to peak form. Wilkinson has earmarked the club's Premiership match at Bristol on February 18 - more than three months since he last played in the top-flight - for his return. I think it's a bit too late for the Ginger Kiwi, he should have come North after the Lions tour. I reckon himself and COCKbain would an interesting confrontation.